This Valentine’s Day season we’d like to talk about a popular gift choice for this time of year: Heart-Shaped Jewelry! Below are some heart-shaped gift ideas that will make any Valentine’s Day pop. One obvious choice is the Heart Lock Necklace, which is generally a heart-shaped lock which comes along with a matching key — both dangling from a petite necklace for that special someone. These can often be anywhere from simple to intricate, often styled in sterling silver, some featuring diamond accents, etc. Heart hoop earrings are another fantastic Valentine’s Day gift that will stand out and get your significant other in a Valentine’s Day sort of mood. Heart-shaped earrings can either be open, or you can opt for something like polished gold heart-shaped studs which will give off V-day vibes aplenty. 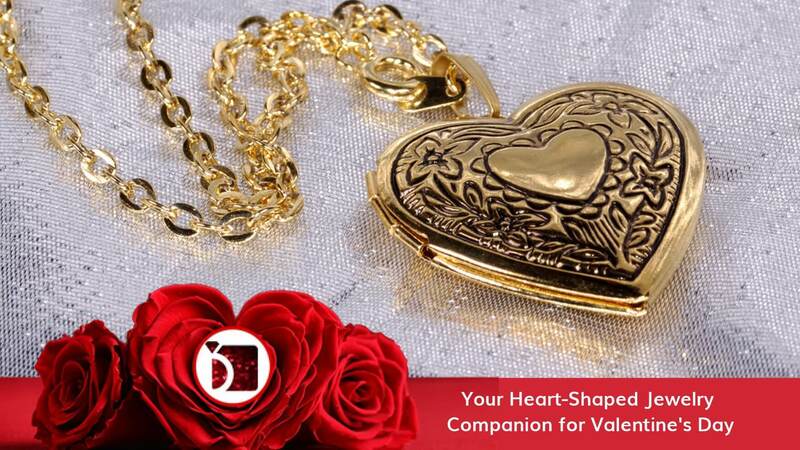 Heart lockets are another popular choice for her along with heart-shaped pendants, charms, and heart bracelets. There are plenty of options specific to Valentine’s Day that will show your loved one they are on your mind and in your heart. If you’re shopping for heart-shaped jewelry, it might be a little more of a challenge to land on something for the fellas. That’s okay. There are still ways to get creative in this department. You don’t have to opt for socks, ties, or golf clubs if you don’t want to. Heart-shaped tie bars are a great and festive accessory. There are also fantastic heart-shaped cufflinks available — for both men and women. It’s a great way to bring you and your partner’s love to the workplace. No matter what you decide to get, there may be a chance that your heart-shaped jewelry needs to be fixed at some point. Just like any other type of jewelry, your heart-shaped jewelry will go through wear and tear or need to be serviced or repaired — we can help with that sort of thing. My Jewelry Repair has an easy online mail-in process. We can repair rings, watches, necklaces, bracelets, earrings, and more. We have locations on the East and West coast of the United States and are now performing repairs nationally. We wish you a happy and heart-shaped Valentine’s Day this year.